With the license management of LOGINventory you manage all relevant licenses for software, operating systems and access licenses (CALs). 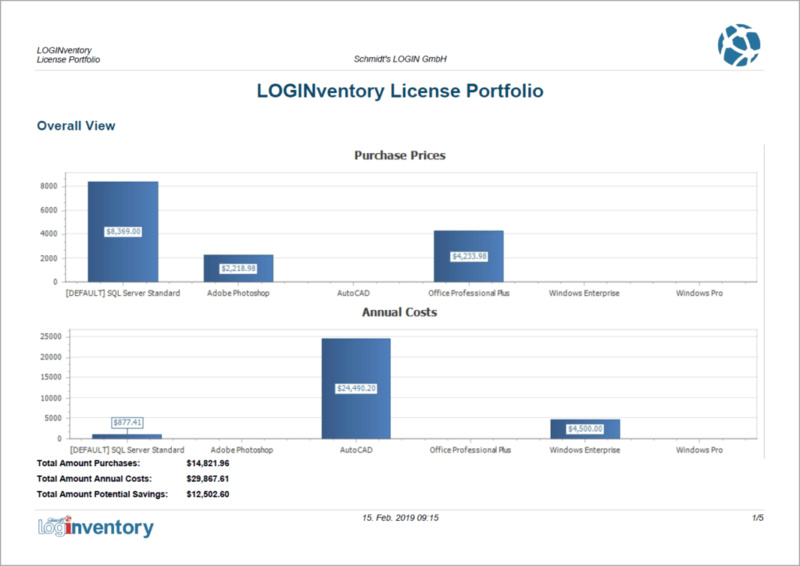 The LOGINventory software License Management enables you as License Manager or CIO to establish a License Management process in your company. This process provides you with all necessary means for the administration of your license inventory. Using our license management solution, you can implement a Software Asset Management (SAM)-process in your company according to the specifications of major software manufacturers such as Microsoft or Adobe. Our goal is to assist you in obtaining complete transparency about the consumers of licenses, the existing and missing licenses, as well as about the actual usage of software. With this we go far beyond a target/actual comparison and ensure that you have all the necessary information to constantly approach the license optimum and actively contribute to the business success of your company. 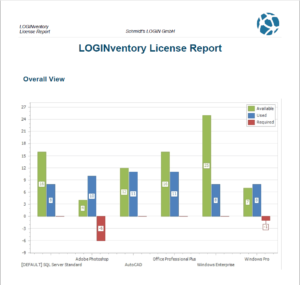 Based on the complete inventory of your network, our license management software automatically provides evaluations so that you can immediately recognize where underlicensing or overlicensing exists. 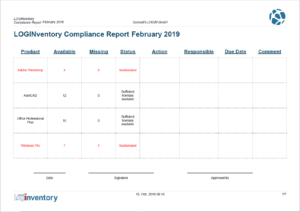 Furthermore, you will be automatically notified if there are not enough licenses left and you can also have Compliance Reports created for audits. To ensure that all users of licenses are displayed correctly in the license management, it is first necessary to inventory all devices in the network. This will automatically detect where which software packages and operating systems (physical and virtual) are available. 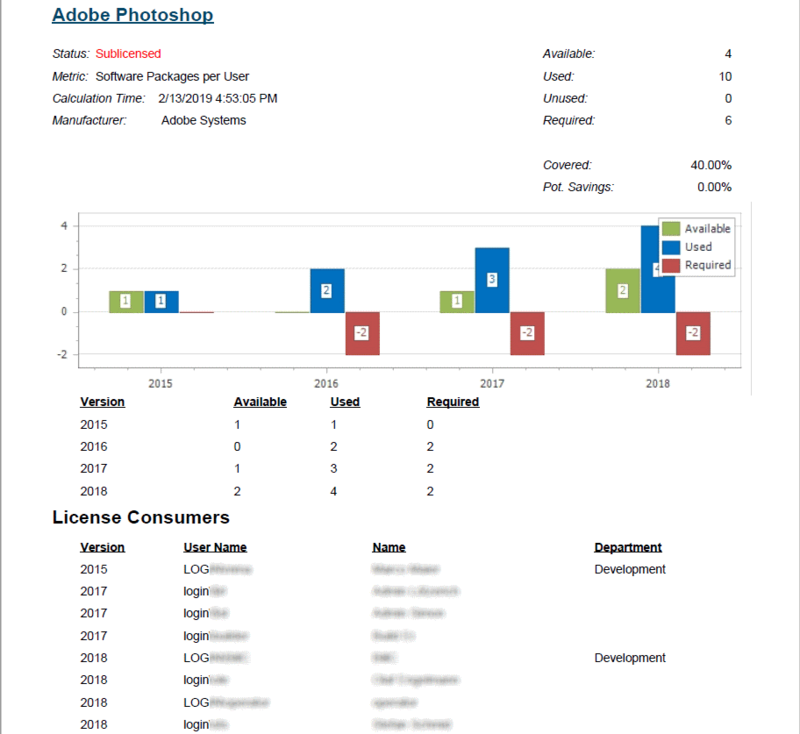 Our license management software supports a large number of license metrics (or license types) to ensure that the consumption of licenses is calculated correctly. For example, you can differentiate whether the product to be managed is licensed per device, per user, per group membership or per host. 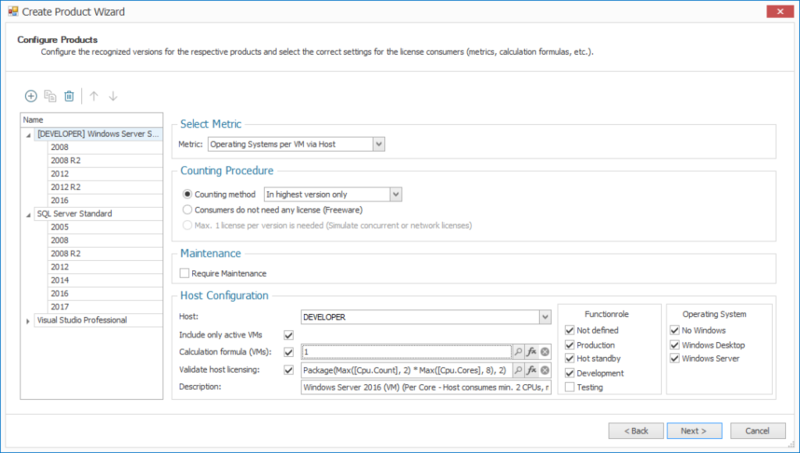 Furthermore, calculation formulas for consumption can be stored in the license management, which is necessary, for example, to map a Windows Server licensing, which depends on the number of cores or CPUs of the host. Of course, irrelevant systems such as test environments can also be excluded. 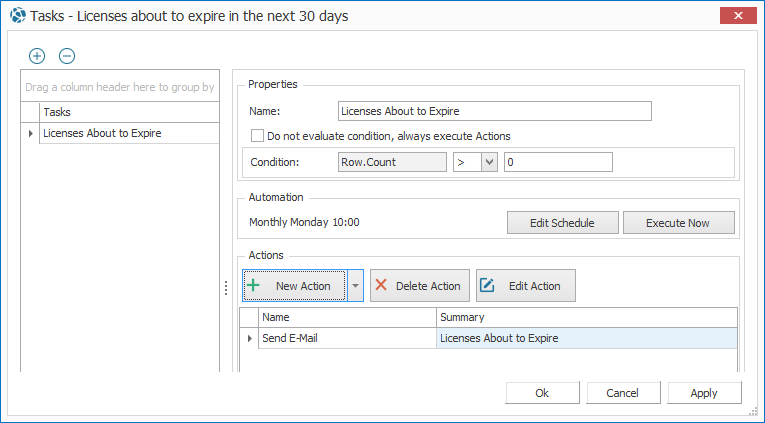 For common products LOGINventory automatically recognizes which type of license counting and which license metrics have to be selected and creates them automatically. Storing Licenses and Contracts for Software, Operating Systems, CALs, etc. For each product that has been added to license management, you can enter your company’s license inventory. 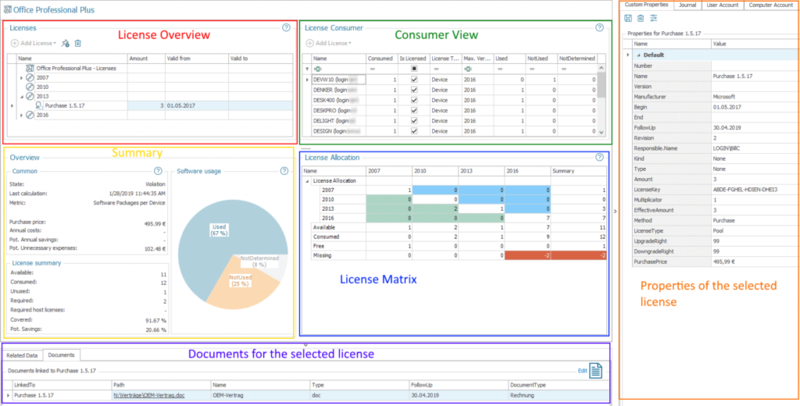 Different types of licenses can be stored, e.g. pool licenses, device licenses, OEM licenses (automatically recognized), user licenses, subscription licenses or maintenance licenses. 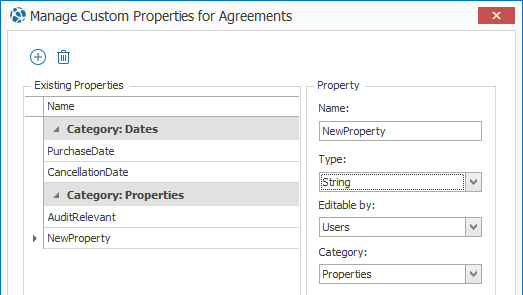 For all licenses, additional details such as expiration date, termination date, purchase price, annual costs, license manager, as well as freely definable own fields can be stored. 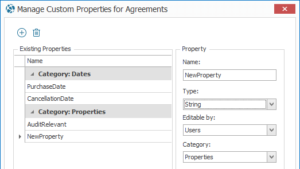 In addition, contract or license documents can be linked , so that you can manage all important information about your licenses in one central location. 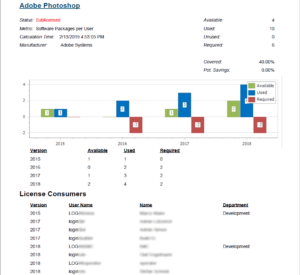 With this data from the license management, automated numerous evaluations in the form of queries and reports are made available to you. Of course, these evaluations can also be adapted to your needs. 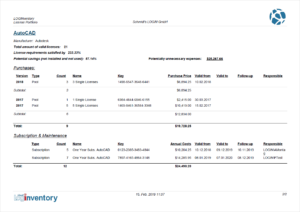 For example, you can see which licenses have not yet been assigned to consumers, which license costs are to be expected for the next year, or which contracts when expire or should be terminated. 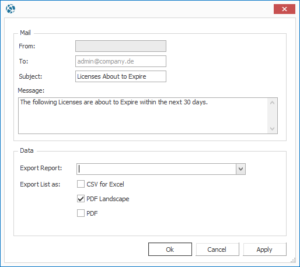 For the optimization of your license inventory it is necessary to establish transparency about the actual usage of software licenses. 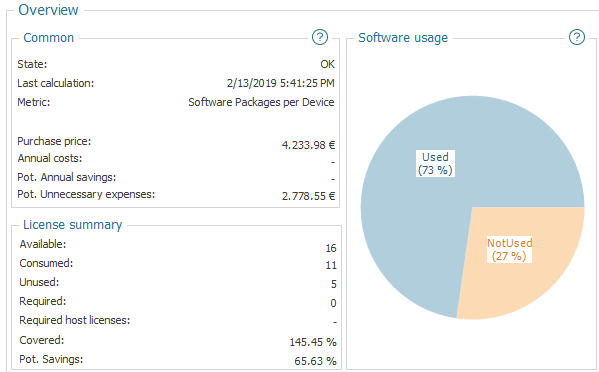 With our license management solution you can analyze on which devices which user has used which product. 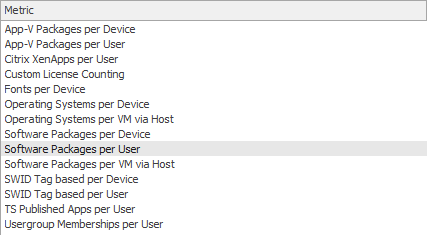 When inventorying this usage data, all data protection requirements are of course met. 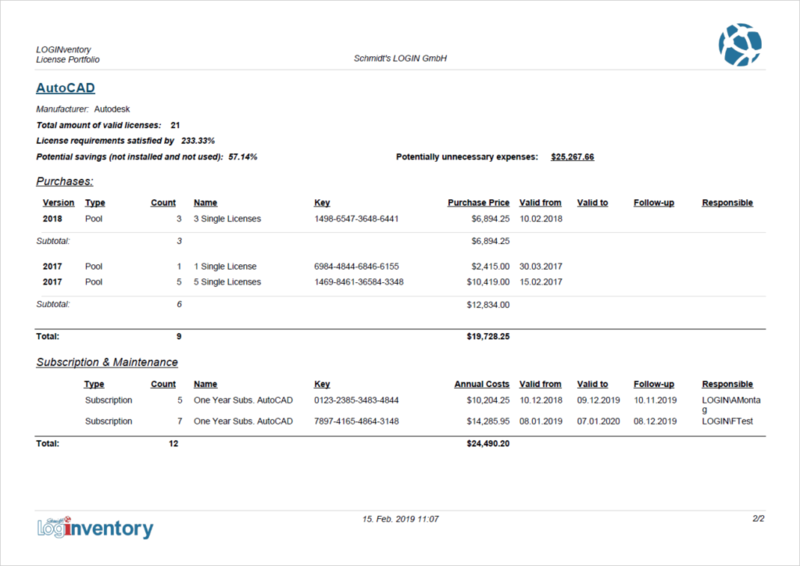 With the license management of LOGINventory you can identify unused products and thus determine the actual demand – not only on the basis of the installations. 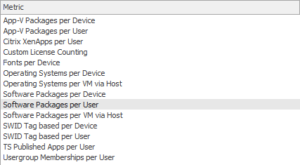 These savings potentials through unused software should not be neglected! Our license management software is equipped with many features to keep the time required for operation, maintenance and audit preparation within reasonable limits. 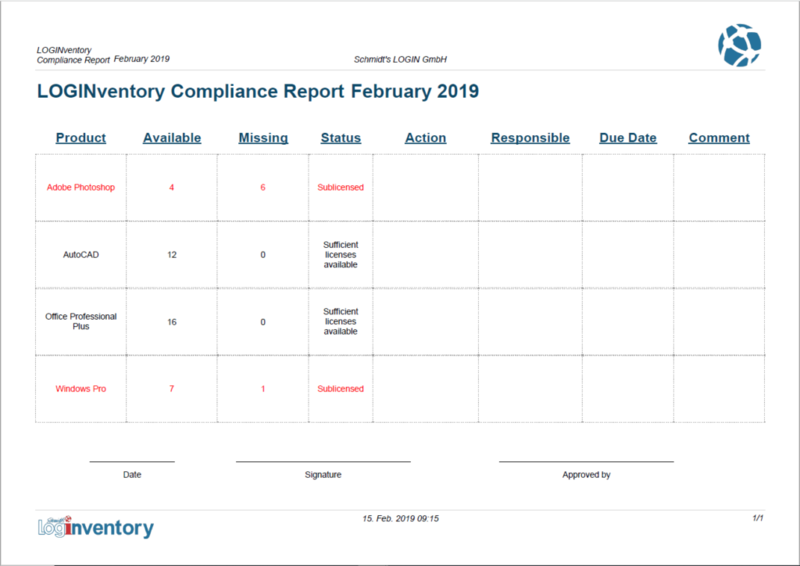 Days of preparation for proof of compliance are a thing of the past, as you can quickly and easily document your license status throughout the year with the help of our supplied reports . 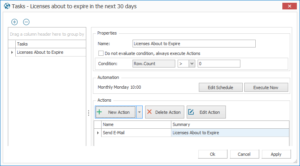 With the help of tasks you can send reports automatically or have them filed. Or you can get notified by e-mail if underlicensing occurs, new unused software is discovered, or unwanted software packages are recorded in the inventory. 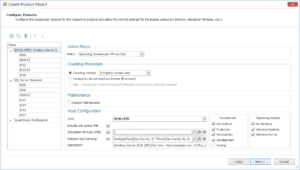 Furthermore, Microsoft Windows OEM licenses are automatically detected and created. 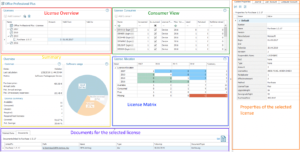 All in all, our SAM solution provides all the functions you need to manage and document your license inventory quickly and conveniently.